Dementia is defined as a chronic disorder of the mental processes caused by either brain injury or brain disease. Dementia is marked by memory disorders, personality changes and impaired reasoning. Dementia is not a specific disease though. Dementia is an overall term that describes a wide range of symptoms characterized by a decline in mental ability that becomes severe enough to interfere with daily life. This includes Alzheimer’s disease, vascular dementia, dementia with Lewy Bodies and even Parkinson’s disease. Current estimates of dementia sufferers vary considerably based on the age group. But the numbers for just one segment of the dementia spectrum is staggering. This is Alzheimer’s disease, which affects up to 5.3 million Americans. Worldwide, the prevalence of dementia, in any of its forms, affects 5 to 7 percent of adults age 60 or older. Most forms of dementia are the result of changes in the neural pathways, but the cause of these changes is still undefined in most cases, unless there was traumatic brain injury. Due to this inability to define the cause of the neural changes, the current treatment methods are also variable and definitely not reliable. Traditional Chinese Medicine (TCM) is a holistic medical system that includes the modalities of acupuncture, cupping, moxibustion and herbal formulations. Of all these modalities, acupuncture has been studied the most intensely. 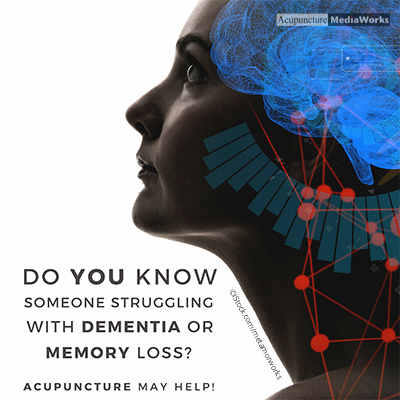 And this has led to studies showing acupuncture can help with the symptoms of dementia. There are many symptoms associated with dementia, aside from memory loss, including depression, anxiety and changes in sleeping patterns. Acupuncture can effectively treat depression and anxiety by balancing the hormones in the body. This will also help with insomnia, which is common in those experiencing dementia. Electroacupuncture has also shown promise for dementia patients. Electroacupuncture is the same as traditional acupuncture, but it adds a small current of electricity through the acupuncture needles, which increases the ability to break up blockages and get energy flowing properly. This is especially helpful for those suffering from vascular dementia, which occurs due to impaired blood flow that deprives oxygen and nutrients from the brain. Studies show the use of electroacupuncture can reduce behavioral deficits and improve memory over time. It is clear acupuncture can help those suffering from this debilitating disease. Even greater success is achieved when used in conjunction with AmpCoil bioresonance/PEMF, herbal medicine, Asea-Redox molecules, dietary changes, Chiropractic, and Electro Sound Lymphatic drainage… Contact us to see how we can help you or your family members who may be afflicted with dementia and memory loss.